It’s amazing that this has grown from a small, simple wooden box to all these events and ideas. I’m a retired firefighter. I currently work part time in a bar, and devote all of my spare time to pedalling for Parkinson’s – which has basically become a job! What is The Bike Box Project? I used to ride my ‘rinky-dink’, beach cruiser bike everywhere – and everyone in town recognised me. Then, eight years ago, my father – like my grandfather before him – was diagnosed with Parkinson’s. I started to think that if I’m always on my bike anyway, I may as well do something positive with it. I decided to put a little box on the back so people could throw change in and I began collecting for The Michael J Fox Foundation. In the first three months I raised over US $1,000. I also ended up organising a sponsored group bike ride from New Bern to Atlantic Beach – which is 40 miles. I started getting more and more backing from the community – people were actually looking out for my bike so that they could contribute. Four years later, and I’ve raised nearly US $40,000. I donate half of my money to The Michael J Fox Foundation and the other half I keep locally for anyone who needs it. Whether it’s installing shower bars or a ramp up to somebody’s door, or even flying family members home who want to be with their loved ones, I can write those cheques now. What motivates you to keep pedalling for Parkinson’s? We learned eight years ago that my father has Parkinson’s. My grandfather also had the condition, so at a young age I saw how the disease progressively took over. Knowing I’m going to see that with my dad is unsettling, so I want to do anything I can to keep him around for as long as possible. If that means donating my time and energy to raise money so that he can get the right medicine, that’s what I’m going to do. Bethany on a sponsored bike ride from New Bern to Atlantic Beach. Have you always been a keen cyclist? Not at all. I never thought I’d be a cyclist with the tight pants and all the gear – I didn’t believe that sitting down and exercising was a thing! As I got older, I started to appreciate how much easier it was on my body. My dad has got into cycling too and he rides with me. It’s pretty cool that we can do it together and it’s all for the cause. Where have you cycled to? 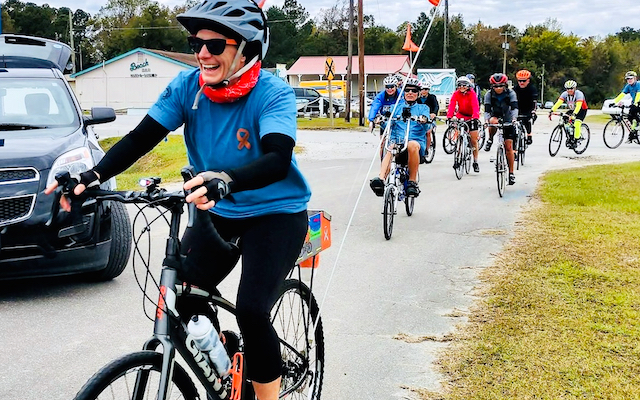 We’ve done New Bern to Atlantic Beach for three years now – we started with 25 riders and this year we had 130. I love that beach ride – it’s scenic and flat so anybody in any shape can do it. I also do a lot of cycles for other charities. I’ve got one coming up for wounded veterans. Have you been surprised by people’s generosity? It blows me away on a daily basis and it often makes me cry. We are a small town but the backing is phenomenal. It’s not just change that I pull out of my bike box – it’s bills. People look out for my bike so that they can put their US $20 note in there and they always turn out to any event I put on. It’s amazing that this has grown from a small, simple wooden box to all these different charity events. Do you have any other fundraising plans? 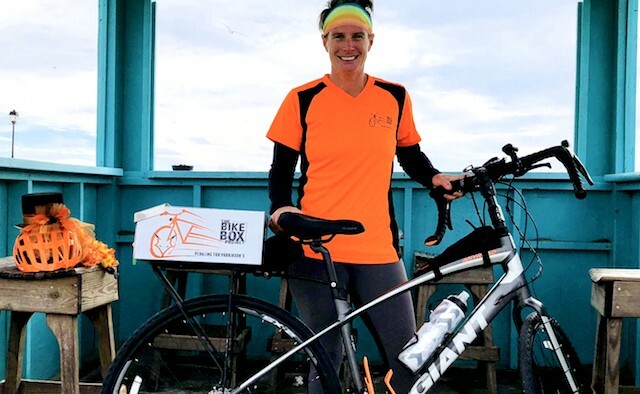 Right now, I’m focussing on The Bike Box Project and cycling across different states. I like the exercise aspect of it. It drives me to get out of bed and on my bike because I think, ‘What if someone wants to donate money today and I’m not there to collect it?’. I want to ride from North Carolina to New York City in time for the next Michael J Fox gala dinner in 2020. I’m always thinking, ‘Yeah, that was good – but what can I do next?’.